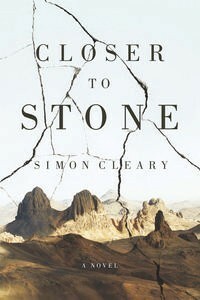 Simon Cleary’s second novel, Closer to Stone is a stunning novel. It opens in Casablanca, where (as shown in the Sensational Snippet that I posted last week) the central character Bas Adams is overwhelmed by a culture completely alien to a country boy from The Springs near Toowoomba. He is on a quest to find his missing brother. Bas has lived in the shadow of his more impressive older brother since childhood. The boys’ bombastic father makes no attempt to conceal his preference for Jack, who has fulfilled the family’s military destiny by becoming a peace-keeper with the UN in the Western Sahara. It is unthinkable that his mysterious disappearance could be desertion. Bas is expected to put his (by inference, trivial) work as a sculptor on hold and to find out what’s happened. And despite some vaguely ambivalent feelings, Bas, because he loves his brother, does what he’s told. He’s not a psychologically strong personality like his brother, he’s a follower. Deserts, despite dangers well-known to any Aussie, seem to be romantic places, and Cleary masterfully evokes the ascetic beauty of the Sahara and its isolated settlements. Images from the films The English Patient and Lawrence of Arabia spring to mind; we feel the winds, we can almost taste the gritty sands. A laconic Aussie called Logan at the military base, and a chance meeting with a beautiful American volunteer called Sophe provide leads, and Bas – no longer alone – sets off for places ever more remote. Ironically, the journey seems to become a little safer as public transport and corrupt officials in larger towns are left behind, but private transport over rough roads is rugged indeed. The discomfort of bouncing around on the tray of a ute in extremes of heat and cold is visceral. And there are still significant hazards, not the least of which is suspicion and hostility against westerners who don’t respect the local culture. Bas, blundering through a culture he doesn’t understand, does his best. He reads his guide-book obsessively, he adjusts to a backpacker kind of life without any of the pleasures of the trip. But he never learns more than the most rudimentary Arabic, relying instead on his school French (which is, of course, the language of the only too recently removed French Occupation). What’s more, his own faith is Catholic and he’s affronted when Lhoussine, a passenger on the bus finds the Bible wanting in comparison to the Qur’an. Bas surprises himself a bit with his own defensive reaction: although he was moved by religious ceremony as a boy and he has nostalgic memories of his dead mother’s Book of Saints, his religion in adult life has been low-key. He’s had no experience of religious extremism, and is mildly surprised by Logan’s scorn for religious schools which teach children to chant a holy book and not much else. Bas is completely taken aback when he’s harshly rebuked for depicting the human form in a small sculpture that he’s made. At this stage, however, he’s prepared to consider that Islamic art captures a kind of purity, because as a sculptor, he sometimes feels a kind of ambivalence about the assault on the stone. Nothing in the world of The Springs had perpared me for this. Suddenly all those Arabesques I’d seen, all those tiled mosaics on the floors of those hotel foyers began to make sense. The fading hennaed patterns on Sophe’s hands when she held them out to me. Look, see. Flowers and plants indivisible. An infinite pattern extending beyond the visible world into the eternal. A part of me had registered the absence but hadn’t yet translated it into thought. Just another of the countless things that had disturbed me since I’d been there, unsettling in a way I hadn’t even realised. Sometimes the most profound things are the most difficult to see. That to introduce the human into art might be an affront to the perfection of God. Naïve he may be, and still hidebound by the kind of insular life he’s led, nevertheless he is vaguely open to considering ideas from a different point of view. And so he is utterly unprepared psychologically for an act of terrorism which transforms his life. Tackling motives for and responses to terrorism is a brave venture, for any author. It’s fraught territory. When the novel becomes a meditation on of a change of heart provoked by religious extremism (both Christian and Islamic) it risks censure from both ends of the tolerance/intolerance continuum. It won’t please moralists of righteous anger who preach Old Testament retribution or moralists in opposition, those who preach forgiveness. We have seen this dichotomy for ourselves when the bereaved of 9/11 and the Bali bombings are interviewed. Cleary’s depiction of Bas’s response seems utterly realistic to me but is the first I’ve seen so bravely tackled in literature. While Bas’s tortured path towards redemption made me feel uneasy, I think the power of fiction to open a window on feelings usually suppressed is not to be denied. This is a signficant, thoughtful and thought-provoking book. Angela Meyer reviewed the novel for the SMH as did Jay Daniel Thompson for The Age. It certainly is brave to tackle the terrorism subject in this way. I’d be interested to learn something about the writer…one for your ‘Meet an Aussie Author’ series perhaps? You must be psychic Karen, I just sent off an email to him today, keep your fingers crossed! I will really look forward to learning something about him.